Sunrise at a picturesque valley in Carmel, near Kalamunda (photo: James Whineray). Who knew that Perth had hills? Or that this WA escape harbours Tuscan outlooks and French provincial charm? It might surprise you to learn that Perth has hills. The flat, western metropolis that stretches like a yawning supermodel along its never-ending coastline has always drawn the eyes to that sparkling Indian Ocean. But over its bronzed shoulder, visible with a backward glance, is a backdrop of gentle valleys, hills raked with blossoming orchards and a long escarpment smothered in native bush, wildflowers and rounded boulders. Poked in between are boutique wineries where the feel is authentic rather than designer handbag; market gardens that welcome curious visitors; cafes where the fare is injected with love and a botanic park that’s carpeted in the colour-pops of tulips. Bucolic and unhurried, it’s a secret escape that the city shouldn’t be allowed to keep to itself. Setting my GPS for the Hills village of Roleystone, I see it’s about a 35-minute eastward drive from Perth’s urban heart. That’s little more than a jaunt to Fremantle, a trip most of us would do without a second thought. Some 125,000 tulips have piqued my interest, the springtime drawcard of Araluen Botanic Park. Oggling fields of tulips might sound like something best left for Holland, or one’s latter years, but from the moment I pay the $6 entry and wander into the lush grounds, Araluen astonishes. Rather than the manicured, denuded rectangular fields that might be expected, these tulips cluster beneath grass trees, magnolias and liquidambars, edge reflective pools and line a serpenting uphill path. 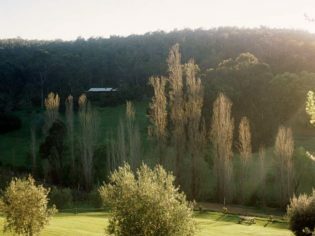 One of the many orchards in Pickering Brook (photo: James Whineray). Although bulbs are planted en masse by volunteers, the result is an almost natural feel, like an accidental wonderland and I am duly enchanted. I spend most of the day roaming in awe and picnicking in a secret garden shaded by giant ferns, just one hideaway in the 14 hectares of English-green nature first established in 1929. Revving the engine along Canning Road, the view from the window is of row upon row of fruit trees espaliered flat, until the bitumen splits through thick Aussie scrub pinpricked by tall native trees. Arriving in Pickering Brook, I stop in at Core Cider, an historic property run by the descendants of Italian immigrant Giovanni Battista Della Franca – or ‘Jack’, for short. Lambs stick with mum in Pickering Brook, a suburb that’s part of the Perth Hills (photo: James Whineray). Beyond the humble concrete bench Jack liked to sit on is an expansive wooden tasting room and open-air restaurant facing a slope festooned with apple, pear and lemon trees. “We also have plums that we use in our fortified wine, quince for our sparkling, as well as pomegranates and persimmons,” says Emily Lyons, who’s married to Giovanni’s grandson, John. As we walk through the trees they shower delicate petals on the ground, like confetti at a wedding. But the idyllic scene could’ve been lost were it not for family drive and dedication. Chirpy staff at the pretty property take visitors on walking tours, explaining how the restaurant’s waste water is treated and recycled onto the orchards, how its coffee grounds and the artisan cidery’s juicing pulp are turned into mulch, and how biodynamic principles are followed. This summer, pick-your-own activities and fruit tasting experiences will create more reasons for people to linger. The promise of Tuscan-style hills and French provincial outlooks draws me away to nearby Bickley Valley. I beeline to a white asparagus farm, where everything is done by hand. Its owners, Harrie and Petra Smeets, have been organically growing the sought-after vegetable – plus its green and purple cousins – for more than 30 years. They happily welcome sticky-beakers, though you have to be an early bird to see them snipping stems – something that’s entirely possible since they transformed the property’s century-old cottage into dreamy accommodation a year ago. The charming, country chic meets classic interiors are one thing, but it’s the peripheral-filling view that’s completely arresting. Beyond the cottage’s towering ceilings, a cantilevered deck reveals rolling hills sweeping into a gentle valley with a softly flowing brook at its toes. At dusk, kangaroos bound through the tall grass. It’s the sort of scene you could gaze at for hours. Geese take a morning stroll at Piesse Brook (photo: James Whineray). Petra, who hails from Germany, was working as a nanny when she met Harrie, a Dutchman with a gig as a chauffeur at a five-star hotel in Switzerland’s St Moritz. They came to Bickley in their twenties, eventually taking over the farm from Harrie’s parents. Decades later, they’re as transfixed with their chosen home as when they arrived. I rise early to peek inside black plastic tunnels protecting the snowy asparagus from sunlight, as Harrie and his team fill the back of a ute with the morning’s harvest. Returning to my abode, Petra brings a breakfast tray of traditional German waffles with warmed cherry compote and whipped cream. With another nod to her homeland, there’s also freshly baked bread showered in seeds, sliced cheese and paper-thin salami. Milk comes in vintage bottles tied with jute. I never want to leave. The couple wave me off with tips on the local wineries, so small there’s a good chance of meeting the low-key owners or winemakers. And just around the corner, newly opened Plume Estate competes with the cottage for the most jaw-dropping views in the region. 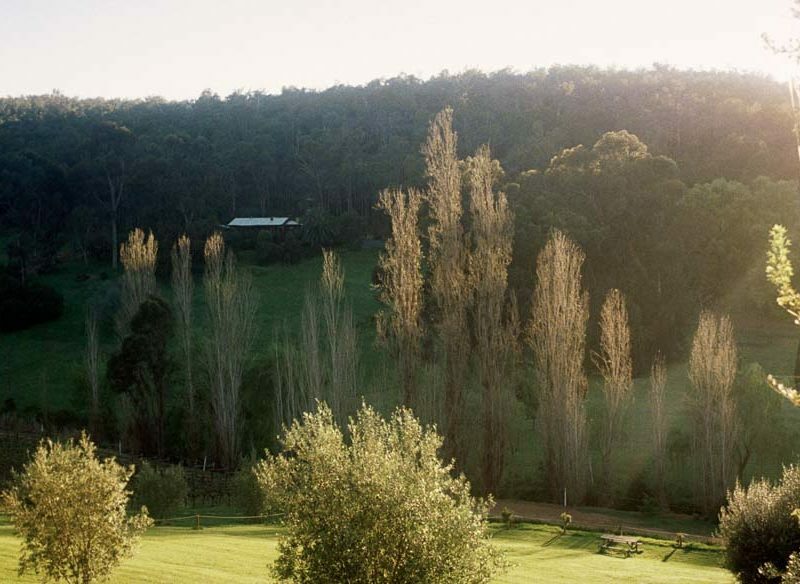 Like most of the cellar doors on the Bickley Valley Wine Trail, the doors are only flung open Friday to Sunday, welcoming weekend escapees to soak up the verdant vista. At the bottom of the valley, The Vineyard Kitchen anchors Brookside Vineyard, which is so adored it books out a fortnight in advance. Its driveway leads to a corrugated iron ‘dining shed’ wrapped in mauve wisteria. The restaurant whips out crumbed Fremantle sardines with parsley caper mayo and duck cassoulet as those without reservations lean on the wooden tastings bar. A classic turns heads on the main drag in Kalamunda (photo: James Whineray). With bottles clinking in the boot, I make tracks for Kalamunda, another sweet Perth Hills village that’s blessed with weekend markets and several polished cafes. Jack & Jill (at the top of the hill, get it?) lays claim to the region’s best breakfast – think fried chicken and waffles, thyme-braised pork, eggs benedict with cider hollandaise, or paleo muesli – while Mason & Bird nail brunch. The best burger in the Hills can be found at Jack & Jill, Kalamunda (photo: James Whineray). Named after the town’s timber mill pioneers of the 1870s, the licensed cafe’s house-made pasta is a thing of beauty – hardly surprising given the chef left one of the most polished restaurants in Perth to start up his passion project. I finish my Perth Hills escape with a wildflower hunt in John Forrest National Park, WA’s original and oldest national park, named after the explorer who became a WA premier. Walking trails ribbon throughout, the most popular one tracing a circa 1880 railway route, called the Railway Reserves Heritage Trail. Western grey kangaroos lunch in the sun at John Forrest National Park in WA (photo: James Whineray). Back then, the conservation reserve contained a garden of exotic species that has since been returned to native plants. “It was rather different to how people view a national park nowadays,” laughs Skillen. Indeed, some 120,000 people drive into the park each year – not counting those who walk or bike ride in – many of whom seek out wildflowers in spring. Skillen says the 15-kilometre Eagle View loop trail reveals plenty of the bush beauties, but equally a 50-metre walk from the park hub will grant tiny blooms tucked into the bush. Within minutes I’ve encountered vibrant flowers with endearing names such as the heart-leaf flame pea and variegated feather flower. As the sun begins to plunge in the west, western grey kangaroos come out to forage, unbothered by the humans they share the scrub with. Several laze out the back of the John Forrest tavern, a genuine old-school watering hole that revels in its throw-back style. It still does $10 Monday night roasts, a sure sign if ever there was one that the Perth Hills are still delightfully undercover. The mock Tudor façade of the Best Drop Tavern Restaurant, Kalamunda (photo: James Whineray). Cruising there: The Perth Hills are an easy 30- to 40-minute drive from Perth’s city centre. Staying there: Bickley Valley Cottage is a beautiful cottage on an idyllic farm, the asparagus is in season from late August until November. A colourful bus stop in the Perth Hills town of Kalamunda (photo: James Whineray). Araluen Botanic Park – Open year round, but the best time to see the tulips is from September and October. Core Cider – Open Wednesday to Sunday, year round; pick fruit from February to March and see the blossoms in October and November. The Vineyard Kitchen at Brookside Vineyard – A great spot to have a hearty lunch before sampling wines. Jack & Jill – Be sure to stop in here for breakfast. You missed out on a night of stargazing – Perth Observatory is only a couple of minutes down Walnut road from the asparagus farm, and you can book for a session almost any night. That’s definitely a next-time, with a bit-more-time-to-spare must for us. Thanks Andrew!